Bastien und Bastienne is the only one of Mozart’s operas to have been written for performance in a private house rather than a theatre. It was commissioned at some point in mid-1768 by the renowned and controversial German physician Franz Anton Mesmer, and Mozart composed the work in Vienna soon after completing his ill-fated comic opera La finta semplice. No details of its première have survived, and scholarship was further hampered by the loss of Mozart’s autograph manuscript until it miraculously resurfaced in Krakow in the 1980s. We are greatly indebted to the musicologist Linda L Tyler for her work in clarifying the unusually complex genesis of this slight but charming work. The story of the work’s origins begins in Paris before Mozart had even been born. Parisian musical circles in the early 1750s were dominated by a hard-fought intellectual debate between the relative merits of French tragic opera and Italian comic opera. A performance in Paris of Pergolesi’s intermezzo La serva padrona on 1 August 1752 had sparked the eruption of this debate into what became known as ‘La Querelle des Bouffons’ (‘the squabble of the comedians’; ‘Les Bouffons’ was the name by which the troupe performing Pergolesi’s opera became known), and for the next two years there was a furious exchange of letters, articles and pamphlets on the subject. As with so many such trends and movements, however, the seeds of the quarrel had already been gestating for some time. One of the leading figures in the debate was the Swiss philosopher and sometime musician Jean-Jacques Rousseau (1712-78). Born in Geneva and largely self-educated, he had come to Paris in 1742. Here, while he was developing his philosophical writings, he also attempted to establish himself as a composer, and he even submitted to the Académie des Sciences a proposal for simplifying musical notation by substituting notes with ciphers. This proposal was rejected, most vehemently by Rameau, but it did reflect Rousseau’s firmly-held belief that music should be simple and dominated by melody (though to be fair to his opponents, Rousseau’s musical education and talent barely allowed for anything more complex). In the spring of 1752, just a few months before the infamous performance of Pergolesi’s La serva padrona, Rousseau penned his only enduring composition, Le devin du village. This unpretentious ‘intermède’ was inspired by the comic operas that he had heard in Venice during a brief posting as secretary to the French ambassador there, and it marked a deliberate attempt to recreate the unadorned charm and simplicity of Italian comic opera in the French language. Numbers were linked by sung recitative rather than spoken dialogue, and the libretto—also by Rousseau—was a generic tale of two young shepherds, Colin and Colette, being reconciled in love by an unnamed Soothsayer (the ‘devin’ of the title) after Colin has briefly been lured away by the attractions of the nearby Lady of the Manor. The work was premièred at Fontainebleau on 18 October 1752, and was an immediate success. It was presented in Paris the following spring, and was to retain its place on the French stage for the next sixty years. The path from Rousseau’s Le devin du village to Mozart’s Bastien und Bastienne is a long and complicated one. The instant popularity of Rousseau’s piece in Paris soon prompted a parody (then as now a sure sign of a work’s success), Les amours de Bastien et Bastiene, by Marie-Justine-Benoite Favart and Harny de Guerville. This version, which was premièred at the Comédie Italienne on 26 September 1753, retained Rousseau’s plot but hardly any of his original text, with Rousseau’s classical French being replaced by more robust and colloquial language. More significantly, Rousseau’s alternation of recitative and air was replaced by an unvaried succession of poetic stanzas that were sung to pre-existing popular vaudeville tunes (this was consistent with established traditions of Italian commedia dell’arte and Parisian comedy troupes), with the result that Rousseau’s recitatives and fourteen numbers became in Favart and de Guerville’s version a continuous sequence of forty-six airs. Dramaturgically, however, the parody improved on the original by extending the argument of the young lovers (now called Bastien and Bastiene) and telescoping the dénouement (five of Rousseau’s fourteen numbers take place after the lovers’ reconciliation) into a single number. It also incorporated some topical populist touches, such as the Soothsayer (now called Colas) first arriving with bagpipes and later delivering a ‘magical’ incantation with gibberish text; both of these new elements subsequently found their way into Mozart’s opera. Les amours de Bastien et Bastiene proved no less popular than the work which inspired it, and it eventually found its way to Vienna, where it was performed at the Laxenburg Palace and the Burgtheater in the 1750s. In 1764 Giacomo Durazzo, the director of the city’s popular Kärntnertortheater, commissioned one of his leading comic writers and actors, Friedrich Wilhelm Weiskern, to create a German translation of the work (two years later Charles Burney’s English adaptation, The Cunning-Man, was to prove very popular in London), and Weiskern was assisted in his endeavours by one of his colleagues at the theatre, J H F Müller, who wrote the text for 'Mein Liebsten schöne Wangen' and 'Er war mir mir sonst treu' and the first two stanzas of 'Geh hin!'. The second ‘n’ in ‘Bastienne’ seems to have been incorporated before the work arrived in Vienna, and Weiskern’s new version was entitled Bastien und Bastienne (actually just Bastienne on the title page, but Bastien und Bastienne at the head of each subsequent page of the libretto). Weiskern’s German translation remained loyal to Favart and de Guerville’s text, but he did modify its form into the standard structure and style of a Viennese musical comedy, turning most of the French stanzas into spoken German dialogue (in prose) and selecting fourteen numbers to adapt more freely into German verse. Coincidentally, this was the same amount of set-piece numbers as in Rousseau’s original libretto. For nine of Weiskern’s fourteen numbers he retained the exact metre and syllable count of Favart and de Guerville’s text, so that his German lines could be sung to the same prescribed French vaudeville tunes, but for the other five ('Mein Leibster Freund', 'Auf den Rat', 'Tätzel, Brätzel', 'Er war mir sonst treu' and 'Geh hin!') he changed the verse structure to such an extent that new music was required. This task was undertaken by Johann Baptist Savio, music director of the Prague-based troupe of Johann Joseph von Brunnian. Savio’s music has not survived, but the Weiskern-Savio version of Bastien und Bastienne was in the repertoire of a travelling children’s troupe which visited Salzburg in 1766 or 1767, so Mozart might even have been familiar with this work by the time he departed for Vienna on 11 September 1767. The motivation for the Mozart family’s visit to Vienna was the imminent wedding of The Archduchess Maria Josepha—sister of Emperor Joseph II—to King Ferdinand I of Naples (he was also Ferdinand III of Sicily), and by the time the Mozarts arrived the festivities were already in full swing. Within a few weeks, however, the Archduchess had succumbed to the smallpox epidemic that was sweeping through the city, and suddenly the whole rationale for the Mozarts’ trip unravelled. The planned festivities were cancelled, the theatres closed and the visiting aristocracy departed, and as the epidemic spread the Mozarts removed themselves firstly to Brünn (now Brno) and then to Olmütz (Olomouc). The children were nevertheless unable to avoid the disease, and Wolfgang came close to dying, but thanks to the intercession of a Salzburg acquaintance who was now dean of the cathedral and rector of the university in Olmütz, they were treated in comfort and recovered before the end of the year, returning to Vienna on 10 January 1768. Nine days later they were granted a two-hour audience with the Empress Maria Theresia and Emperor Joseph II. It was seemingly at the behest of the Emperor that Mozart composed a full-length opera buffa, La finta semplice, over the next five months, but in the event the musical establishment closed ranks to prevent the work’s production. Mozart’s infuriated father petitioned the Emperor, and they remained in Vienna for several more months in the increasingly forlorn hope of having the opera performed, but to no avail. It was presumably at some point during the course of this wait that Mozart was commissioned to write a short opera for private performance in the house of Doctor Franz Anton Mesmer. Born near Lake Constance in 1734, Mesmer had studied theology, philosophy and law in Vienna before turning to medicine. He achieved widespread notoriety—and notable early success—with his use of magnets to disrupt what he considered to be gravitational tides adversely affecting his patients, but the orthodox medical fraternity found his theories and methods increasingly controversial, and he was eventually accused of fraud and forced to leave Vienna. Mesmer was a keen cellist and harpsichordist, and also played the glass harmonica to patients to induce them into a trance-like state. He was famously satirised by Mozart and Lorenzo da Ponte in the Act One finale of Così fan tutte. In January 1768 Mesmer married the wealthy widow Maria Anna von Bosch, and in so doing became a well-known figure in Viennese society. The Mesmers were soon entertaining lavishly at their splendid house in the Landstrasse suburb of Vienna, and it was here that Mozart’s Bastien und Bastienne was performed (one of Mozart’s early biographers claimed that the performance took place in the Mesmers’ garden theatre, but this had not been built by 1768). The final part of Bastien und Bastienne’s early history is also the one that has caused the most confusion. After the Mozarts’ return to Salzburg early in 1769, their friend Johannes Schachtner—a court trumpeter and writer who was later to create the libretto for Mozart’s Zaide—took it upon himself to revise Weiskern and Müller’s text, believing their language to be too harsh and unpoetic. This revision involved a few small changes to the sung text that Mozart had already set, but because the music had already been written Schachtner had to fit the exact syllable counts and stresses of Mozart’s pre-existing music. Far more significant, however, was Schachtner’s decision to rewrite all of Weiskern’s spoken dialogue, replacing it with verse which could then be set to recitative and sung; Mozart did indeed set the first four of these, but understandably seems to have run out of enthusiasm. The repercussions of Schachtner’s revision, however, in conjunction with the loss of Mozart’s autograph manuscript, led musicologists to various false assumptions. Firstly the Vienna commission and première seemed to contradict the known involvement of Schachtner, who had remained in Salzburg throughout 1768, and it was therefore surmised that Mozart had already started work on the opera in 1767 before he left for Vienna. Secondly, all of Schachtner’s changes were incorporated into the accepted version of the work, with the ridiculous result that it began with sung recitative between each number and continued with spoken dialogue. It was only with the rediscovery of Mozart’s manuscript in the 1980s that the truth was established. Now scholars were able to prove that Mozart used Viennese paper which would almost certainly not have been available to him in Salzburg, and even a perfunctory examination of the manuscript shows that Mozart originally set Weiskern and Müller’s text verbatim—in the handful of places where Schachtner subsequently made changes to the sung text there are clear crossings out on the manuscript, with Schachtner’s words added above or beneath them. 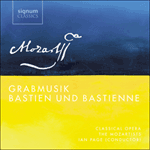 As far as we know, this recording is the first performance of Mozart’s original setting of Bastien und Bastienne since its première at Dr Mesmer’s house 250 years ago. The twelve-year-old Mozart was already a master at matching his compositions to the scale and ambition of the commission, and his music for Bastien und Bastienne perfectly matches the rustic simplicity of the libretto. Over half of the arias last for less than two minutes, but they unerringly capture the dramatic and emotional situation. Note, for example, the speed and efficiency with which Mozart establishes each character within their first aria—Bastienne’s forlorn melancholy ('Mein Liebster Freund'), Colas’ blustery swagger tinged with genuine compassion ('Befraget mich ein zartes Kind'), and Bastien’s exuberant complacency that all will be well now that he has decided to return to Bastienne ('Großen Dank'). The emotional temperature rises with the soulful tenderness of Bastien’s 'Meiner Liebsten schönen Wangen', in which Mozart employs flutes for the only time in the piece, and with the splendidly combative duet ('Geh hin!') in which the two lovers pugnaciously exchange musical stanzas. If Bastien’s despair in the brief accompanied recitative ('Dein Trotz vermehrt') reminds us of Papageno’s near suicide, we should remember that Die Zauberflöte itself belongs to the same tradition of German singspiel, and that many of these moments were stock set-pieces of the genre. Finally, the consecutive ensembles with which the work ends negotiate a potentially clumsy and sudden resolution with consummate skill and subtlety. Perhaps the most popular number in Bastien und Bastienne is Colas’ pseudo-magical spell to nonsense words, which is one of few numbers in the opera whose derivation can be traced directly back to Le devin du village. Rousseau’s French gibberish begins 'Manche, Planche,/Salme, Palme', which became 'Tätzel, Brätzel,/Schober, Kober' in Weiskern’s German adaptation. 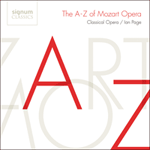 This is the only number, however, for which Schachtner’s Salzburg revision provides entirely new words—'Diggi, daggi,/Schurry, murry'—and it has been suggested that this text might have been the work of Mozart himself. Certainly it would have appealed to Mozart’s sense of humour, and we have included 'Diggi, daggi' as an appendix on this recording. The shepherdess Bastienne has been abandoned by her sweetheart, the shepherd Bastien, who has been lured away by the attractions a noble lady from the city. She wretchedly laments her plight and seeks the advice of Colas, who has established a reputation as a fortune-teller and magician. Colas reassures her that Bastien still loves her and will soon return, but recommends that when he does so she should feign indifference. Bastienne departs to tend to her flock, and Bastien now arrives. He joyfully tells Colas that he has seen the error of his ways and is looking forward to being reunited with Bastienne. Colas congratulates him on his decision, but warns him that he is too late and that Bastienne now has another admirer. Bastien, distraught, urges Colas to consult his Book of Magic. Colas casts a terrifying hocus-pocus spell, after which he predicts that Bastien will be able to win Bastienne back if he works hard to take better care of her. Bastien is left alone, and when Bastienne returns she rebuffs him, saying that he cannot be her Bastien, for he was faithful and loving. Bastien tries to persuade her that Colas has banished the malevolent forces that were overpowering his judgement, but they continue to argue until Bastien declares himself ready to commit suicide. Bastienne wishes him good luck. Eventually, however, they acknowledge that their love for each other remains undimmed, and Colas returns to celebrate the happy outcome. Mit ihm ist Schlaf und Ruh dahin. Der Kummer schwächt mir Aug und Sinn. Und diese Not bringt mir den Tod. and with him have gone sleep and rest. sorrow dims my eyes and senses. and this distress will be the death of me. Gesichtes willen kehrt er mir den Rücken? O Schmerz! arme Liebe … gute Nacht! his back on me for the sake of a pretty face? O woe is me! Wretched love … goodnight! stunned and quite unable to think. schenke. Sie sind von klarem Golde. Colas: Geh, meine Tochter, mit deinen Ohrbuckeln. Bastienne: Wie? du willst sie verschmähen? ich mit ein paar Busserln fürlieb. du mir? Soll ich sterben? Colas: Eh, mach dir deswegen keinen Kummer. Colas: Er liebt dich vom Grunde der Seele. Bastienne: Und doch ist er mir ungetreu? Bastienne: Aber, wenn er einmal mein Mann werden sollte? ungetreu. Er liebt nur den Aufputz. good fortune for a pair of beautiful eyes! be satisfied with these earrings that I’m giving you. They’re made of pure gold. Colas: Away with your earrings, my daughter. Bastienne: What? You wish to spurn them? with a couple of kisses. about my marriage. What do you advise me? would be an eternal pity. Colas: Oh, don’t worry yourself about that. Colas: He loves you from the bottom of his heart. Bastienne: And yet he is unfaithful to me? Bastienne: But what if he becomes my husband one day? unfaithful. It’s just the finery that he loves. Die er bei dem Raub empfand. Ward ihm ja von mir gegönnt. Da ich ihm so viel getan? that he felt from the theft. was truly offered to him by me. after having done so much for him? fehlen, wenn man die Gewogenheiten bezahlt? lovers if we pay for their affections? Von den schönsten Herren aus der Stadt. Und mit Liebe wird ein andrer nie belohnt. of the most handsome men in the city. and no other man will ever be rewarded with my love. machen es die Damen der Stadt. weathercock. He’ll come back, I assure you. But you must get used to a different approach. well and whether my shoes and stockings are clean. beloved, when in reality one truly longs for him. Sei, mein Kind, mit Fleiß bedacht. Daß man ihn zu Nutzen macht. Colas: Wirst du mir auch dankbar leben? Bastienne: Ja, mein Herr, bei Tag und Nacht. Nimm ein muntres Wesen an. Bastienne: Gut, ich tu so viel ich kann! you must heed carefully, my child. Colas: And will you continue to be grateful to me? Bastienne: Yes, master, by day and by night. Bastienne: Yes, master, as well as I can! man euch, gnädige Herren, kaum über die Achsel anschaut. be encountered anywhere other than in the country. object of love whom Bastienne prefers to a Junker*. Sirs, scarcely even looking down on you! Die des Lebens Glück verspricht. Ist für mich kein wahr Ergötzen. Macht mich mehr als Gold erfreut. Mr Colas, is my duty. she who offers a lifetime’s happiness. hold no real delight for me. pleases me more than gold. Colas: Man hat dir den Abschied gegeben. and for once take heed of my coaxing. Colas: You’ve been given the push. not give her heart to another man. Bastien: Geh! du sagst mir eine Fabel. Welcher anders denkt als spricht. Muß die Glut von mir entstehn. Bastien: Get away! You’re telling me a fairy tale. who thinks differently from what she says. the fire must result from me. Bastien: Ei der Henker! Wie sollte das zugegangen sein? Bastien: Soll ich es glauben? Ist das wahr? Bastien: O Potztausend! Wie bin ich so unglücklich! einziger guter Tag zieht oft hundert böse nach sich. als wenn die Leute gut miteinander verstanden sind. Zauberbuche nach deinem Schicksal erkundigen. Bastien: Hang it all! How could that have happened? Bastien: Should I believe it? Is it true? Bastien: Oh, a thousand curses! How unhappy I am! hundred bad ones behind it. look up your fate in my book of magic. Hosper, Hiper, ho, hi, to! Mirlar Vistan li, la, lo! Darlar Busslan quid pro quo. Bastien (furchtsam): Ist die Hexerei zu Ende? Bastien: Aber darf ich sie auch anrühren? Colas: Ohne Zweifel, wenn du kein Hackstock bist. Geh! Bastien (fearfully): Is the sorcery at an end? will see your shepherdess again. Bastien: But may I also touch her? have done up to now. Gold kann ich um sie verschmähn. Weg mit Hoheit, weg mit Schätzen! Eure Pracht wirkt nicht bei mir. Hundertmal noch mehr als ihr. Schätzten sich durch sie beglückt. Doch umsonst! hier sind die Grenzen. Wird der Reichtum hier verlacht. and for her I can disdain gold. Away with grandeur, away with treasure! Your glitter does not work on me. a hundred times more than you. consider themselves fortunate through her. will riches here be mocked. wenn ich davonlaufe, verliere ich sie ganz und gar. Bastienne: Wer bist du? Geh! ich kenne dich nicht. doch! Kennst du denn deinen Bastien nicht mehr? away I will lose her completely and utterly. Bastienne: Who are you? Go away! I do not know you. all the same! Do you not then know your Bastien any more? Nur ich, sonst nahm ihn niemand ein. Sein Blick war bloß auf mich gericht. Die oft sein Blick in Glut gesetzt. Doch nun will er sich andern weihn. Vergebens ist jetzt meine Liebe. he was captivated by me and no one else. more than all the others. he gave them to me to keep. He loved me, and me alone. and my love is now in vain. Übel wie das meinige ist gar kein Mittel. Bastien: Heirate! Der Ehestand heilt alle Zaubereien. Das beste Mittel ist ein Mann. Bastien: Oh, I can already see what’s annoying you. You think I’ve changed; but you’re wrong. like mine there is no cure. the best cure is a husband. Bastien: Geh hin! Dein Trotz soll mich nicht schrecken. Mein Herz gehöre gänzlich ihr. Will ich mich gleich mit ihr verbinden. Die hundert Herren fesseln kann. Will ich mich gleich mit ihm verbinden. Wodurch mein Blick sie glücklich macht. Soll sie mich gar nicht spröde finden. In Städten zu erwerben leicht. Nichts, als daß man sich freundlich neigt. Soll man mich stets sehr höflich finden. Bastien: Go away! Your scorn will not frighten me. that my heart belongs entirely to her. I shall pledge myself to her at once. I can easily find admirers there. who can fascinate a hundred gentlemen. I want to pledge myself to him at once. whereby my gaze will make her happy. she will not fid me at all coy. are easy to obtain in cities. but to curtsy in a friendly manner. one will always find me very courteous. Bastien: Ist das dein Ernst? … Geh! sag! Soll ich bleiben? Bastienne: Ja … Nein, nein. Bastien: Is that what you really want? … Go on, say! Should I stay? Bastienne: Yes … no, no. Bastien: Dein Trotz vermehrt sich durch mein Leiden? Mir Messer, Dolch und Strick. Bastien: Ich geh mich zu erhängen. Im Bach mich zu ertränken. Bastienne: Viel Glück zum kalten Bad! Bastienne: Have a good time! Bastien: I’m going to hang myself. to drown myself in the stream. Bastienne: Have a good time in your cold bath! Bastienne: Was ist’s? Was hält dich denn auf? meinem Ende noch mit dir reden muß. Bastienne: Mit mir reden? Nein, ich höre dich nicht mehr. Bastienne: What is it? What’s keeping you then? Bastienne: Speak with me? No, I won’t listen to you any more. Bastienne: Geh! geh! geh, Herz von Flandern! Drum laß ich Dorf und Flur. Bastien: Ja, wie du siehest. Ist schon mein Tod bestimmt. Kein Knecht von dem Rival. Bastien: Wie? du rufst mich? Da dich mein Scherz erfreut? Bastien: Ich bleibe dein allein. Bastienne: Ich würde dein auf ewig sein. Und lieb dich bis in’s Grab. don’t love you any more. therefore I am leaving the village and the field. Bastienne: Deceiver! You are fleeing? Bastien: Yes, as you see. my death is already decided. but will not be a slave to my rival. Bastien: What? Are you calling me? no longer to be found. when my jests made you laugh? Bastien, Bastienne: It has now passed. once more devoted to you. Bastien: I would remain yours alone. Bastienne: I would be yours for ever. for I love only you. and will love you until I die. Auf! Auf! gebt euch die Hand! Knüpft die Seelen und die Herzen! Von Colas, dem weisen Mann! Hat er Wunder heut getan. Auf! auf! stimmt sein Lob an! O, zum Geier, welch trefflicher Mann! Colas, Bastien, Bastienne: Auf! auf! stimmt sein Lob an! thank my magic power for that. Up! Up! Give each other your hand! Join your souls and your hearts! ever be known to you. of Colas the wise man! he has today performed wonders. Up! Up! Sing his praises! He has brought about our wedding celebrations. Oh, hang it all, what an excellent fellow! Colas, Bastien, Bastienne: Up! Up! Sing his praises!